The types of light bulbs you can buy are about to change—again. In 2020, we'll be hitting the second phase of the Energy Independence and Security Act of 2007, which requires light bulbs be more efficient than ever. In 2012, the law started taking old—and much beloved—incandescent bulbs off the shelves in favor of low-energy halogen, compact fluorescent, and LED bulbs. These efficiency standards don't apply to all bulbs: only what the Department of Energy calls "general service lamps" are subject to these requirements, which covers the average household bulb that fits into your lamps and lighting fixtures. However, there are a lot of lights it doesn't cover, including appliance lamps, rough service bulbs, 3-way bulbs, colored lamps, stage lighting, plant lights, candelabra lights under 60 watts, and outdoor post lights less than 100 watts. That means there are a lot of older bulbs—yes, even classic incandescents—that will still be available on store shelves. But even with those exceptions, store shelves will look different in a few years as LED bulbs are the only ones that meet the 2020 efficiency standards. Still, we wouldn't call this change reason to panic: LEDs have dropped dramatically in price since 2012, last longer than any other bulb, offer a wide variety of color options, come in traditional light bulb shape, and even have high-tech "smart" options. With all of these features, we expect the compact fluorescent to vanish, completely unmourned. What are my light bulb options? Energy-saving incandescents (halogen): These lower wattage incandescent bulbs have a tungsten filament like standard bulbs, but are surrounded by a halogen gas, rather than argon or nitrogen, which provides bright light with better efficiency. These are 25% more efficient than traditional incandescent bulbs and will last three times as long. Prices start at just under $2 per bulb (60 watt equivalent) on Amazon. Compact fluorescents (CFLs): You've probably seen—and maybe hated—these curly, bulb-sized fluorescents. Though early versions tended to offer harsh light, the latest CFL bulbs have more color options and some are even styled to look like traditional incandescent bulbs. These bulbs offer 75% energy savings over an incandescent and last ten times as long. Prices start around $2.50 per bulb (60 watt equivalent) on Amazon. LEDs: The most efficient option, LED bulbs are 75-80% more efficient than traditional incandescents and last 25 times longer—and, yes, starting in 2020 these will be the only bulbs that meet federal energy efficiency requirements. Prices start at just over $3 per bulb (60 watt equivalent) on Amazon. Smart bulbs: Smart bulbs are LED bulbs that can connect to Wi-Fi so you can control them from your computer or a smartphone app. While the functionality is a bit different for each bulb, you can typically tell them to turn on or off at different times and turn them on or off from afar. Some bulbs will even have the option to control the light color. Prices start at just under $15 per bulb (60 watt equivalent) on Amazon. What do I need to know about buying a new light bulb? If you're looking to replace specific bulbs in your household, you're probably used to picking up a bulb that's 60-watt, 75-watt, or the like. Unfortunately these measurements, based on how much energy the bulb used, are not an accurate way to tell how much light bulbs produce—and looking at wattage on new bulbs, which use far less energy, won't get you the right amount of light. If you used to buy 100 watt bulbs, look for a bulb with 1600 lumens. If you used to buy 75 watt bulbs, look for a bulb with 1100 lumens. If you used to buy 60 watt bulbs, look for a bulb with 800 lumens. If you used to buy 40 watt bulbs, look for a bulb with 450 lumens. It's also important to get a light with the right color temperature—especially with CFLs, which can produce a harsh light. You may find LED lights that can, with one bulb, change their color ranges or even produce multiple colors of light. These may be of interest as different color variants may work better for specific tasks—for example, you might want a bright white light while reading but typically prefer a warmer light. Color is measured in Kelvins, ranging from 2,700 K (the warm light of typical incadescents) up to around 5,500 K (proving a daylight or natural tone). Though all of these bulbs produce white light, warmer lights will have a more yellow tint—better for bedrooms and other soft lighting conditions—while cooler lights will have a blue tint—better for reading. Check the packaging to see what kind of light a bulb produces before you buy—and if you're not sure what colors you want, go to your local hardware store where you should be able to see different lights on display. How much will I save with the new light bulbs? When you're buying new bulbs—no matter the type—you'll want to look for the Energy Star label. Energy Star certified light bulbs are tested to meet energy efficiency standards and will include labeling to tell you exactly what you're buying. The Energy Star label will show the bulb's brightness, color, lifespan, energy usage, and what it will cost to run it for a year. This information makes it easy to compare bulbs, especially if you're considering bulbs of different types. Let's take a look at just what each type of bulb will cost you, estimating 3 hours of use per day at $0.11 per kilowatt hour. As you can see, with the falling price of LED bulbs it makes less sense to bother buying older, less efficient bulbs. Even with a higher up-front price, the energy savings over the life of the bulb can be substantial. While smart lights are still pricier than any other type of bulb, they offer new features for your smart home. Smart lights can be controlled from anywhere, which can be a fun gimmick but can also save you a bit of cash when you set your lights to turn off in the daytime—or can turn them off after you leave the house and remember you've left them running. One note about smart lights: most of them are controlled by some kind of hub, either one specific to the lights or a standard system used by other smart home appliances. Many smart bulbs will only work with one type of hub, so be sure you're buying the right bulb for your home. If you're not sure where to start with smart bulbs, take a look at Cree Connected 60-watt equivalent. It comes at a budget-friendly $35 price point and works with a variety of different smart home systems, making it one of the easiest to use. We have energy efficient bulbs all through our house, and we’re constantly having to replace them. I’m all for saving energy, but I want better options before they ban the inexpensive option that works. It sounds like you may be using CFLs, which are known to die more quickly than originally promised, especially when turned on / off over short periods. Have you tried LEDs? It’s not likely you would be replacing them often at all—probably not for years. Get a light rated for 25,000 hours and who knows when you’ll have to replace it again. I just recommend sticking with a known brand or one that’s Energy Star rated to improve odds of something that will really last. Sometimes cheap bulbs will have the drivers die long before the lighting elements would stop working. This article and the valuable comments help me to solve the bulb confusing problem, thank you. Thanks for sharing these useful tips with us. I was just looking for a bulb for the light inside of my car, but I am not sure of the size of its voltage but it is relatively small in my opinion. I am still on a lookout and I hope to obtain a replacement soon as it gets quite inconvenient at night. Part of me misses the days when it was so easy to buy lightbulbs because there wasn’t much of a variety. However, I do live the fact that the products today tend to be more energy efficient. I also appreciated the cheat sheet. It’ll make things quicker. I have a bedroom ceiling fan (Hunter brand), that now has 3 candelabra base incandescent bulbs, and a fourth burnt out bulb. I want to replace the fourth with a dimmable led bulb. Is it safe to mix different types in the same fixture? I prefer to replace over time. Also, it is rated for max 40 watts, but can I go 60 watts with led since it is a cooler bulb? I would then do all 4 at once. Hi Maria. You can mix LEDs and incandescents, but keep in mind that they may not look identical, so the one may stand out. This is especially true if you dim them. Since the wattage will be far less than incandescents, there won’t be any issue on that front. So yes, you could go with a brighter LED if you want; it won’t be 60 watts ... just a 60 watt replacement. It should be much closer to 10 watts. Look at the lumen output for an actual comparison. So to answer what I think you’re asking, yes you could replace all 4 with 60 watt replacements. The TOTAL of all 4 would be around 40 watts—similar to ONE of the bulbs you’re using now. Replacing all at once will help you keep a consistent look in the fan. I’ve found that some ceiling fans now have a “wattage limiter” that will NOT let LED bulbs work. The typical one made now limits current to 190 watts, but does not work under 60 watts or so, so replacing all 4 (typically) with LED that use under that limit will cause the bulbs to not even come on. Also these new fixtures are NOT designed for non-dimmable CFL or LED but for standard incandescent bulbs in the 40 watt range. Also be careful to use dimmable bulbs, such as standard (NOT the more expensive halogen or lower wattage bulbs) in these fixtures. This is probably why new ceiling fans now come with lighting units that do NOT use standard bulbs, but I have found them very dim, not even bright enough to walk around the room with unless you want to bump into furniture. I wish they’d just stop messing with regular bulbs and stop selling all these confusing options like AWFUL CFL’s, bad LED’s and expensive “power saving” incandescents. I just want my regular bulbs back, and not have anything else on the shelves. Who wants to spend hours researching what light bulb to buy when you could just walk in, pick up a 4 pack of 60 watt bulbs for a dollar and walk out? 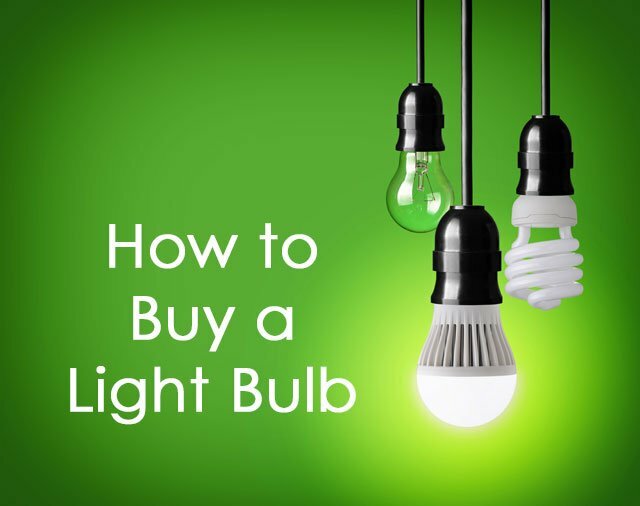 “How to Buy a Light Bulb” helpful article to buy a light or bulb. i confused to buying light for it’s energy , i seen in this article a chart for price. We discuss the bulb options above in terms of lumens. Lumens are a measure of the total amount of light a bulb produces (its “brightness”), and you’ll find the lumen value on the packaging of any bulb you buy. Lux is a measure of how much light a bulb puts out over a given area. Specifically, one lux is one lumen of light spread over one square meter. For general lighting, where you have a bulb stuck in a lamp, the lumen measure is a pretty good representation of the amount of illumination the bulb will deliver because the light will be radiated in all directions. However, in task lighting scenarios, like kitchen light fixtures mounted in ceiling, some of the radiated light will be blocked by the lighting fixture, and what you really want to know is the lux value for the light that will actually be hitting your countertop. The challenge is that the amount of light being blocked is highly dependent on the fixture itself, so there’s no good way to include this in a bulb review. The light fixture itself may provide a “Light Output Ratio”, which will tell you what percentage of the bulb’s output will be output from the fixture. You can also look for flood lamp or reflective bulbs that are specifically designed for in-ceiling placement. And some bulbs may provide additional info on the “beam angle”, which will help you estimate the amount and area of light for your specific application.